Marks and scarring are the bane of my life. As a sufferer of acne (I really really hate that word), I have a lot of scarring and dark marks from old blemishes. The introduction of exfoliating toner into my skincare routine, has made a dramatic difference to the appearance of these marks and scarring. Exfoliating toners are different to traditional toners in that they contain exfoliating ingredients such as AHAs and BHAs (not as scary as they sound). They work to buff away dead skin cells from the top layers of your skin, in turn leaving your skin visibility brighter, smoother and clearer. 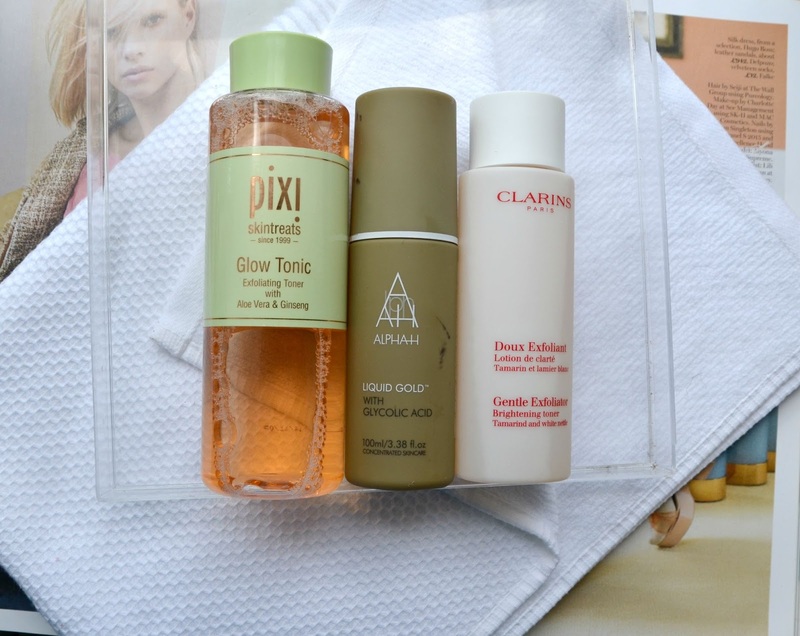 Clarins is my go to skincare brand, their gentle exfoliating toner is a classic in the beauty world. Using an exfoliating toner can be quite stripping on the skin and that's not so good when you have dry skin. However I didn't experience any stripping or any drying of my skin, while I was using this toner. Which is down to the soothing and creamy formula which works to hydrate the skin. My skin always felt softer, refreshed and smoother after each use and after continuous use for about a week or so my skin looked so much brighter and the scars were fading. I have been getting compliments left right and centre since using this toner, my skin looks amazing and I am sure it's down to this. This is one of the most talked about exfoliating toners, ever since it was recommended by Caroline Hirons beauty fanatics have been going cray cray for it. As you can imagine I was pretty excited to get hands on it and I was slightly disappointed by it. Out of all the exfoliating toners I was testing out this one had the least effect on my skin. I didn't notice a lot of difference while I was using it, it was really gentle on the skin and my skin felt really refreshed after use. I think that it does work but it takes a while for the effects to show, which is ok but I really like seeing an instance effect. It is pretty good for the price and you are looking for the more affordable option then this is one to pick up. The liquid gold is a powerful exfoliating overnight treatment, which is supposed to promote cellular activity. I was little apprehensive to try it because of it's high glycolic level and all the warnings that come with and the little fact that I have super reactive and sensitive skin. I have only tried this twice but that was enough for my skin. The first time, I used I didn't notice much difference with my skin except I had small breakout but I didn't think that it was a result of the liquid gold, so I gave it another try the following week. The same thing happened, I had horrible breakouts all over and I wasn't doing anything different so it had to be the liquid gold. My skin was on the right track and now it just looks horrible. This product isn't cheap, so I was really disappointed that it didn't work for me. I gave it to my sister who experience the same thing, which is really weird because a lot of people rave about it. If you include one thing your skincare routine, make it a exfoliating toner. It's an amazing addition to your skincare routine and it does so much for skin. I would definitely recommend the Clarins gentle exfoliating toner, I think that it would work for any skin type and you will definitely see the results.